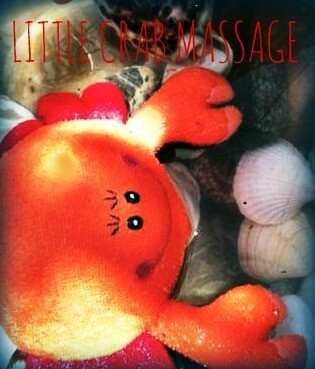 This is a fun massage to do on the beach or after a trip to the seaside. Start by talking about some of the things that you have seen at the beach. With your child's permission, start to trace an object or animal on their back, describing it as you go.
" It is hard, flat and smooth (draw a rounded object). It has speckles on it" (trace small circles on the big one) a pebble. Try different techniques when tracing, either your index finger or the flat of your whole hand. Ask your child which they prefer. Repeat this with a crab. Keep the descriptions simple with young ones and adapt the vocabulary with older ones. Let your child trace something on your back. One day while Ella (substitute with your child's name) was playing at the seaside she discovered a rock pool..
She peered inside and there she saw a tiny crab moving this way and that way, this way and that way. and then suddenly.....nipped her toe! « OW! Let it go ! » She shouted. Repeat the story nipping (gently squeezing) other parts of the body ! Enjoy the giggles that follow!